If you become less mobile you may have difficulty getting into or out of a bed or chair. Raising your chair or bed can make it much easier to stand up and sit down. It can also help to prevent falls. Reaching to support yourself on furniture such as a coffee table can be dangerous, as you might miss the furniture and fall. It's also dangerous to use walking frames or sticks for support, as they can roll away or slip, especially on wood or tile floors. It's better to use raisers rather than sitting on a cushion. A cushion reduces the height difference between your bottom and the arm rests, so it's more difficult to push up from the arm rests to stand up. What is a chair or bed raiser? A chair or bed raiser is a device made out of wood or high-strength plastic that is used to raise the height of a chair, sofa, or bed. This makes it easier to stand up or sit down on your own, without needing someone else to help. Getting a chair or bed raiser means you don't have to buy new furniture. However, you do have to have it custom-fitted, so make sure it is exactly what you need before you buy one. Ask the retailer or supplier to fit it correctly for you, or ask your occupational therapist for advice. 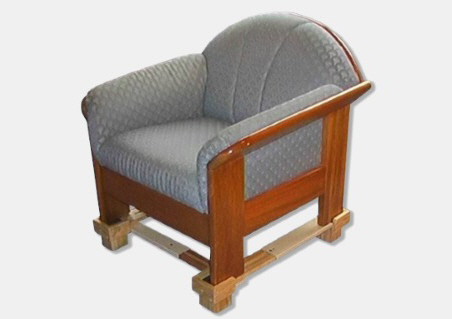 There are two main types of chair or bed raisers: chair or bed blocks, and chair or bed troughs. Chair or bed blocks are plastic or wooden blocks that are designed to sit under each leg of your chair or bed. Chair troughs are sometimes called chair-raising platforms. They are braced together and sit under the chair (the picture shows a chair trough). There are many different types of chair troughs, for different types of chairs. Recliner and La-Z-Boy chairs are particularly tricky to raise, and can tip over if you don't use the right trough. Bed troughs go under the legs of a bed and are also braced together width-wise. How do I install a chair or bed raiser? Installing bed and chair raisers is difficult – don't try to do it alone, as you could hurt yourself. Ask a strong family member to help, or get your supplier or occupational therapist do this for you. Also get someone to help you take the necessary measurements. Does it have casters or legs? If your chair has a platform base or runners, or is a recliner chair, you will need a chair trough. If your bed has legs or casters you can use blocks. Work out how much you need to raise your chair or bed. While you're standing, measure the distance from the floor to the back of your knees. Deduct the second measurement (chair or bed to floor) from the first measurement (floor to the back of your knees). The difference tells you how much you need to raise the height by. If you need any more information about how to use your chair or bed raiser safely, contact the supplier or your occupational therapist. Written by the South Canterbury DHB. Adapted by HealthInfo clinical advisers. Page created August 2017. South Canterbury DHB, Chair and bed raisers. Authorised by M Parish, SM, R Templeton, DOAH. February 2016.